Images of the lunar surface by LADEE's star-tracker camera. It is during lunar night, and the landscape is illuminated by Earthshine. First of all, before i go on the topic, i would like to say i am back again. I have been offline a quite some long time now, but atleast i am back again. I have been really busy to complete my education. On topic now. 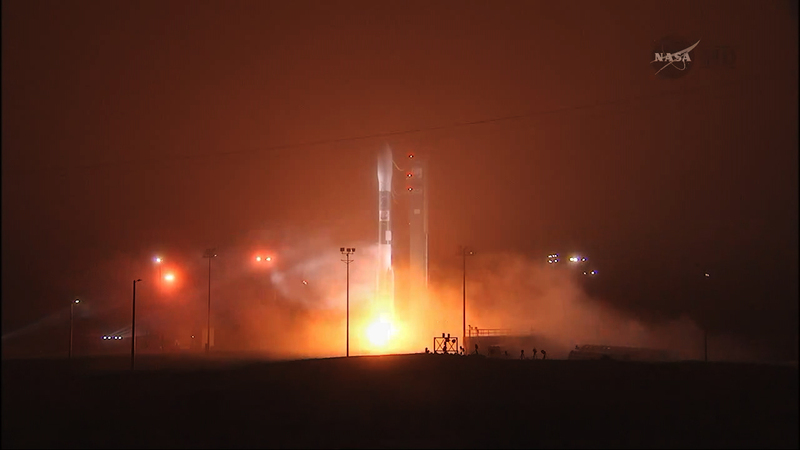 The OCO-2 has successfully launched. NASA has finally launched the spacecraft that will study carbon dioxide in Earth's atmosphere, seeking clues for global warming. In 2009 OCO-1 was launched and was supposed to do the exact thing OCO-2 was gonna do. But OCO-1 failed. A payload fairing failed to separate during ascent. The added mass of the fairing prevented the satellite from reaching orbit. But not this time. This time it successfully got launched up in space. I merged OCO-2 here since it's on-topic for this thread. I am happy to announce that the prototype of new rocket for Russian space program lifted off today after slight delay in schedule. It wasn't an orbital vehicle, and it wasn't manned either (so I guess it goes into this thread anyways). I hope the project will eventually provide an effective alternative to emerging projects of NASA and SpaceX. After all, the previous projects of cooperation with different countries such as South Korea, India and France made it possible to advance the development of the new generation of rockets. I hope the project will eventually provide an effective alternative to emerging projects of NASA and SpaceX. The lift capacity of Angara 1s are mostly below what Falcon 9 would generally carry, so it would not compete there. And Angara 3 and Angara 5 have greater lift capacity than Falcon 9, so again there would be little competition since they are not in the same payload class. The only SpaceX vehicle Angara could potentially compete against is Falcon Heavy, which would compete with Angara 5 and the proposed Angara 7. And given the development cost of Angara (much greater than the cost of developing SpaceX rockets) it would be unlikely that Angara would be profitable if priced competitively with Falcon Heavy, unless the costs of construction and operation are kept very low. And NASA only has one rocket under development, SLS, which is both much larger than even Angara 7 and also not built for commercial launches, so again there is no possibility for competition with Angara. HarbingerDawn, AFAIK the rocket is primary a military application, not commercial, but in effect that also means a platform for commercial payloads can be an alternative use. I'm not talking about introducing analogs, it is quite obvious that design of these American projects is quite different - if that means that US payloads will be only compatible with US rockets then it won't have much effect for the rest of the customers worldwide. It also shows that space industry is in good shape and I'll be looking for development of the specific rocket for new manned spacecraft as well, which will be another story altogether. If nothing bad will happen. The plan is to replace many existing Russian rockets with Angara, so that means that Russia must either market Angara for commercial launches or it will lose customers when it stops flying current ones, like Proton. Orbital Sciences Corporation failed to launch successfully their Cygnus cargo spacecraft to the ISS. The rocket exploded just seconds after the launch. That is some bad news, but on the plus side nobody was injured and the explosion was pretty cool looking. WASHINGTON — NASA approved the Ionospheric Connection Explorer (ICON), a small heliophysics mission set to launch no later than October 2017, to proceed into development, the agency announced Nov. 12. ICON, selected as a heliophysics explorer mission last year, will spend its two-year primary mission studying the ionosphere: a region of space ranging from about 90 kilometers to 900 kilometers above Earth’s surface and filled with electrically charged particles that can disrupt radio signals from satellites. The mission’s principal investigator is Thomas Immel of the University of California, Berkeley. Development costs for ICON, which exclude launch and operations, are capped at $200 million. The mission will be built on Orbital Sciences Corp.’s LEOStar-2 spacecraft bus, a platform designed to last at least five years and that has been the basis of numerous NASA science spacecraft. Construction on ICON would begin in 2015, when ICON is slated for its critical design review. A pair of ultraviolet imaging spectrographs, one tuned to the extreme ultraviolet portion of the spectrum and the other to the far ultraviolet, provided by the University of California, Berkeley’s Space Sciences Laboratory. The Michelson Interferometer for Global High-Resolution Thermospheric Imaging, provided by the Naval Research Laboratory in Washington, which will observe the temperature and speed of the neutral particles in the ionosphere. An Ion Velocity Meter provided by the University of Texas in Dallas that will observe the speed of charged particle motions, which NASA said may be “very different” from neutral ionospheric gas. ICON is the second small science satellite NASA has approved for development in as many weeks. On Nov. 7, the agency said the Transiting Exoplanet Survey Satellite (TESS), also being built by Orbital on a LEOStar-2 bus, passed its confirmation review and would begin development with an eye toward a 2017 launch. NASA’s Launch Services Division will arrange a launch for both TESS, which needs a medium-class launcher such as Space Exploration Technologies Corp.’s Falcon 9, and ICON, which needs a small-class launcher. That makes ICON a potential candidate to launch aboard Orbital’s reliable but dormant Pegasus XL: a solid rocket air-launched from a modified Lockheed L-1011 TriStar jet. The only other small-class launchers on NASA’s Launch Services 2 contract, the catalog from which the agency orders rockets for its science missions, are Lockheed Martin’s Athena 1c and Orbital’s Minotaur-C. The last Athena launch was in 2001. Minotaur-C is essentially Orbital’s Taurus XL solid rocket with a different payload fairing than the one that failed to separate in back-to-back missions in 2009 and 2011, destroying NASA’s Orbiting Carbon Observatory and Glory satellites. Pegasus XL last flew in June 2013, when it launched NASA’s Interface Region Imaging Spectrograph spacecraft. NASA paid about $40 million for that launch, which was the 42nd Pegasus launch. Vakarian, there is already a suitable thread here. Also, in the future, please do not paste the entire text of an article into a post. Take a few moments to write something of your own, then provide links. Who here is looking forward to the flight test of the Orion crew module next week? Launch is happening at Thursday next week. After the earlier launch of Angara A1 in the summer I was waiting for that event to post it there. Russia’s Angara rocket has conducted its first orbital launch on Tuesday morning, flying in its impressive heavy-lift Angara 5 configuration to carry a payload mass simulator into orbit. Liftoff from the Plesetsk Cosmodrome in Northwest Russia was on schedule at 08:57 local time (05:57 UTC). Launch video will be available when test payload is be delivered to geostationary orbit, I will probably post it later. Launch was originally scheduled for Dec 25, and most expectations were that it would be delayed beyond that. I'm impressed that it launched so soon. I hope that better launch video will be available eventually, I've been interested in Angara for years and have been waiting for it to finally fly. Thank you much, I'm sure there will be some launches in the next year and I will wait for that, although I never heard of any newer plans. As for the video, I doubt that a better one will be available until next launch because there were low clouds (less that 500 meters) this time and rocket was only visible for several seconds.